In the Webmail PRO you can now restrict specific items provided by the groupware service. With this being available you can now have items restricted on a user or domain basis. For instance: You can have one domain only see the calendar with no contacts while another domain only sees the contacts but no calendar. This is useful for customers who charge for these services. In order to set the restrictions you need to login to the webmail PRO (/webmail) and go to [Options, Administrator Settings, General, Restrictions] tab. You will see six options you have to allow/restrict for the users under the current domain. 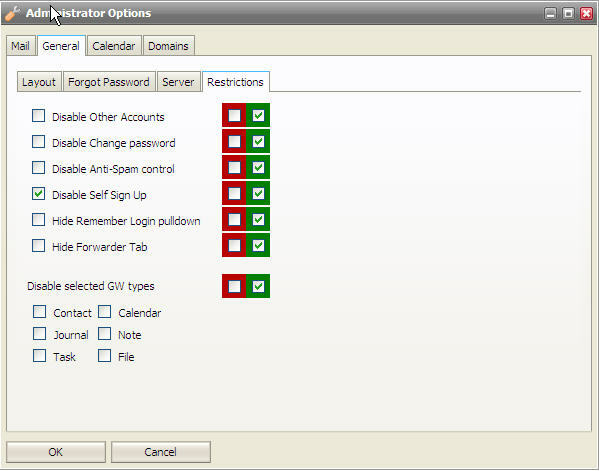 The red box will show it for the whole domain and the green box is only for the user settings. This is all that is needed in order to restrict these options in the new Webmail PRO.